Cycling climbing profile of Col de la Croix Fry from Thones. 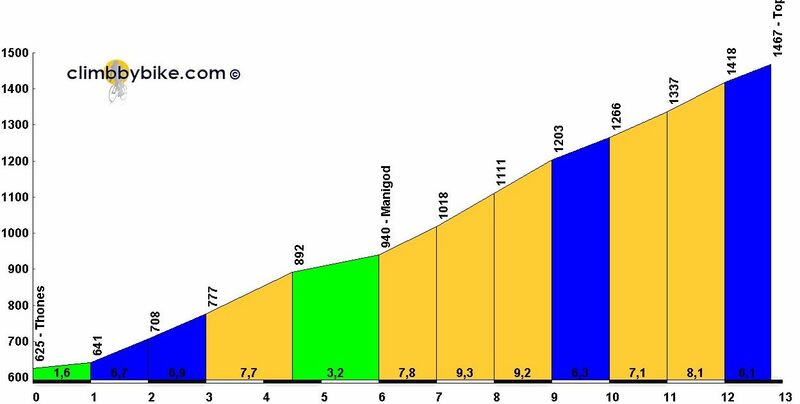 Cycling climbing profile of Col de la Croix Fry from Thones. Col de la Croix Fry, at an altitude of 1467m, is in the Aravis region of the Northern Alps. It links the village of La Clusaz to the valley of the river Fier and the village of Manigod. The climb proper starts as you turn off the main Thones to Serraval road towards Manigod. The gradient averages 7% all the way to the village, where it eases up, before a tough couple of kilometres rarely drop below 10%. The final 4kms vary between 6-8% and pass past traditional alpine chalets bedecked with flowers in the summer before reaching the summit. The Col de la Croix Fry has been climbed four times, most recently in 2013 where Rui Costa rode to victory in the pouring rain.